Microsoft has recently released Visual Studio 2013 and Matthew Johnson has released a new version of the Visual Studio 2013 Color Theme Editor. Unfortunately it doesn’t support (yet?) the Express editions of VS2013. My previous article about using color themes with Visual Studio 2012 seemed to have been quite popular, it’s the most accessed article on my blog... Therefore, to continue the tradition, here is how to install the new theme colors available with Matt’s extension to work with the Visual Studio 2013 Express. 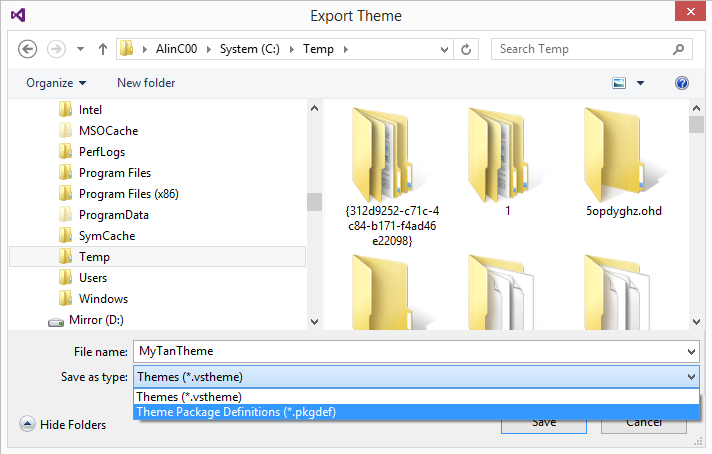 1) First, download the zip file http://www.alinconstantin.net/download/VS2013Themes.zip – it contains the 8 pkgdef files defining the colors of the 8 new themes from Matt’s extension, plus the 9th pkgdef with the theme names. Note: If running on a 64-bit machine, instead of %ProgramFiles% use %ProgramFiles(x86)% because Visual Studio is a 32-bit process. Note 2: Visual Studio Express for Windows Phone was not released for 2013. If you need to colorize Express for Windows Phone 2012, see the Using color themes with Visual Studio 2012 Express Editions article. 3) Open a “Developer Command Prompt for VS2013”. When using Windows 8, search for “Visual Studio tools” and open the folder found. Visual Studio 2013 no longer installs the tools shortcuts directly in the Start Menu to avoid polluting the menu with 9+ rarely used shortcuts. Anyway, once there type the command forcing VS Express to re-read the extensions settings. 4) Start VS Express and the themes should now be available in Tools/Options/Environment/General page. In the FileSave dialog, make sure to set the file type to .PkgDef (by default the extension saves the file as .VsTheme), like this: After exporting the file, copy it in the Themes folder created in step 2) above in your VS Express installation. Now you can repeat steps 3-4) above to force VS Express read the new extension pkgdef file, and you should be able to use the new custom theme in Tools/Options dialog. Worked perfectly for VS2013 Express Web and Desktop. Alin, thank you for the post! Thank you for the wonderful setup-tip MS Visual Studio Express Themes! @Ivo: While you can unzip the files in CommonExtensions\Platform folder, I'd advise against that. That CommonExtensions\Platform folder contains binaries and pkgdef files for features owned by Microsoft's (shell team) and contains various core VS components registration. If you create new themes, you need to make sure you don't use the same name with the files already in the Platform folder, otherwise you'll break the VS install. Also, the folder is common for all VS/Express installations, so now your settings for Express4Web will bleed-through in Express4Destop, VSProfessional, etc. And if you have VSPro-VSUltimate installed on the box with Matt's extension, you'll now have overlapping settings. If Matt updates the colors in his extension, you may not see the updates, depending on hte order in which the pkgdef files gets merged in registry. @Anonymous: Sorry, my computer's power source caught fire and shortcut the MB, too. Time for upgrade... I'm waiting for pieces to build a new computer, ETA for going back online is Tuesday. I really like the solarized dark/light themes. However, I'm using VS 2012 Premium at work. I have the theme editor installed, but am not sure where to put the solarized files to be able to access them in VS 2012. @Steven Archibald: If you have Matt's extension for VS2012, you can use Tools/CustomizeColors window and click the ImportTheme hyperlink on that page. Note that you'll have to edit the files a bit - you'll have to add the name of the theme in the file. then you can use the ImportTheme hyperlink and point to the file. Do something similar for other themes from VS2013 package you may like. Developer Command Prompt is not installed with VS Express 2013 for Web. Thank you , my dear ! I choosed Solarized Dark. I just downloaded and put the themes in the IDE folder . . . and then ran the command to force an update for the desktop vs express (2013). I still do not see the themes . . . what else should I do? 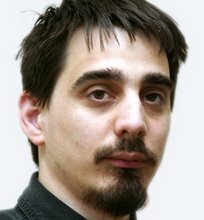 Do you have a solution for Visual Studio Community Edition 2013? @Viktor: I haven't used yet VS Community Edition. I assume it would work to copy the files in a folder under Extensions and run devenv /setup. But my understanding is that VSCommEdition should allow extensions to be installed, which means Matt's extension should just be installable directly from the Gallery. I've pinged Matt to fix if the extension doesn't appear there already. After following your example today, I'm getting this error "The 'SqlStudio Editor package' package did not load correctly." @Viktor: I doubt the error you're seeing is caused by the color themes. If you want to remove it, just delete the files you copied from the disk, and run again "vwdexpress.exe /setup"
Nevermind, I figured it out. I installed this. Dude, you rock. Thanks for this, now I have solarized light theme which I use everywhere. Hey, that is way cool. Followed your instructions to the letter. Thanks dude!